Ewan Christian built this church for the new middle class suburbs off of the Earlham Road in the late 1880s. The busy traffic streams out in the direction of UEA and the A47, and St Thomas sits quietly looking down at it from its imposing site above the road, a large, low church. There is no tower, and there is a restraint in the triple lancet of the east window, and the elegant Decorated style of the aisle. As Pevsner says, it is definitely Late and no longer High Victorian. We would be building churches that look like this until well into the 1920s. When I first tried to visit in 2009, I found St Thomas closed and undergoing a major refurbishment. So it was with some excitement that I came back here in the early spring of 2010. St Thomas is unusual in the inner Norwich suburbs in that it is open every day - militantly so, with a big flourescent orange sign telling you so. Given that we are less than half a mile along the Earlham Road from the similarly militantly open Catholic Cathedral, this way into Norwich serves well the pilgrim with a spiritual thirst. You step into a big, wide, open space, full of light and air. It is enchanting. The crispness is almost entirely a result of the events of the night of 27th June 1942, when the western side of Norwich city centre suffered intensive bombardment by German bombers. 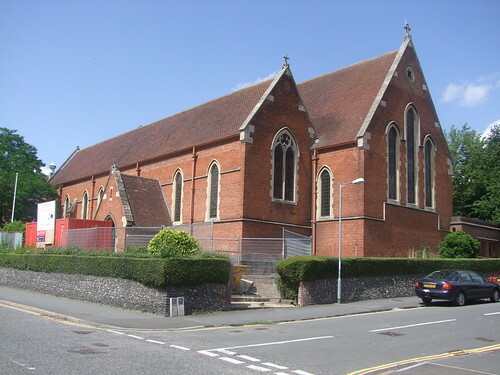 St Thomas was one of half a dozen Norwich churches to be destroyed that late spring and early summer. It was completely gutted, with only the outer walls left standing. It took ten years to be rebuilt, to the design of the Norwich firm Wright & Mason. What you see today is entirely the work of the 1950s and 1960s, which explains its Festival of Britain confidence, a near jauntiness. The great treasure of St Thomas is Norwich's best collection of modern glass outside of the Anglican Cathedral. It is largely the work of the King workshop, and is the largest collection of King glass, again apart from the Cathedral. The best of this is in the south aisle, a sequence of East Anglian Saints of the 1960s and 1970s, the most notable of which is the image of Dame Julian of Norwich with her cat, which is often reproduced in books of her writings. People think it is in the cathedral or in the Julian shrine, but it isn't, it's here. Some slightly older glass in the baptistery, which I think is also by the Kings, depicts scenes of anointing and baptism, and remembers members of the congregation here. A striking Nativity scene is in the south aisle east window. There is also glass by the WIlliam Morris workshop, who contribute the vast and near-psychedelic story of the martyrdom of St Thomas in the main east window. There is a particular smell to interiors of the 1950s and 1960s, something to do with the floor polish perhaps, which I find intensely evocative, taking me back to the self-confident institutions of my own childhood, and more recent visits to the likes of Coventry Cathedral and Liverpool Catholic Cathedral. The light wood of the floors and furnishings, and the white of the walls and ceiling, all contribute to this effect. I wandered around this wide interior with my heart lifted. That this is one of the most welcoming churches in the city only adds to the feeling. A cross carved from a charred beam in a niche in the south aisle remembers the events of that summer night, and a display nearby records this church's close relationship with a similar church in a German city. St Thomas's Vicar Philip Young is a noted pacifist and Quaker, and the sense of peace in this place seems entirely appropriate. At the east end of the building, facing into Edinburgh Road, the dedication stone reads To the Glory of God in memory of the Holy Apostle St Thomas this stone was laid in the name of the Father and of the Son and of the Holy Ghost by John Thomas Lord Bishop of Norwich 28th October 1886 - "Blessed are they who have not seen and have yet believed" . That may be so, but I was really pleased that I had seen inside at last.